The first time I visited New Orleans I was newly pregnant with my first child. My husband was one of a handful of employees who had been gifted an all expense paid trip for two and he foolishly yet lovingly brought along his miserable, exhausted, and frownie faced wife. Every day, as I stepped out of the hotel’s doors, a waft of booze, seafood, trash, and exhaust would send my stomach churning. I spent most our visit in the air-conditioned hotel room, laying in bed, sniffing limes and ordering room service off the kids menu. One group dinner in particular remains forever etched in my mind. We sat outside, which was not unlike dining in a disco themed laundromat, and in a move straight out of Fear Factor, the waiter poured an enormous bucket of cooked crawfish all over the table. The diners dove right in, rolling up their sleeves, cracking heads, pinching tails, sucking meat, while savagely tossing countless carcasses in their wake. 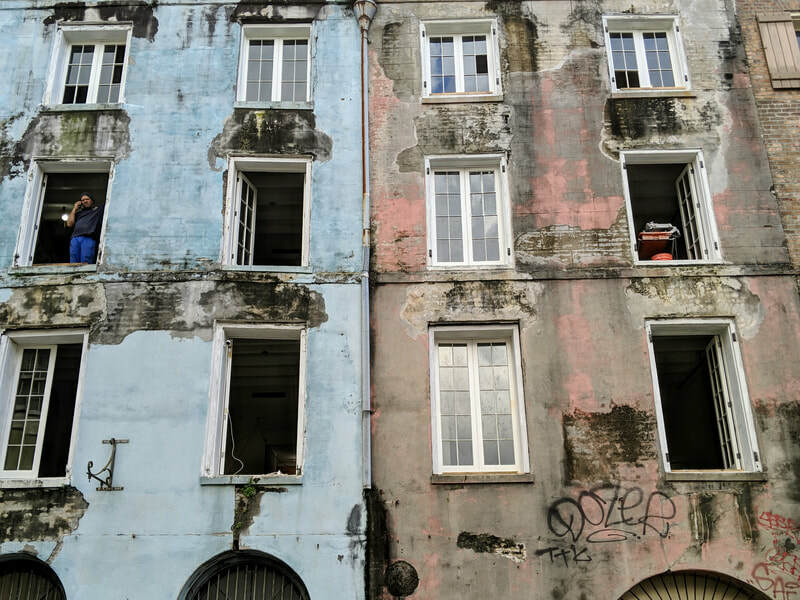 Weeks later, at one of my 10,000 doctor’s appointments, I was diagnosed with hyperemesis gravidarum, and while a more evolved person might have seen the impact the illness surely had on my time in The Big Easy, I continued to write New Orleans off, even describing it as one of the most overhyped cities in the country. 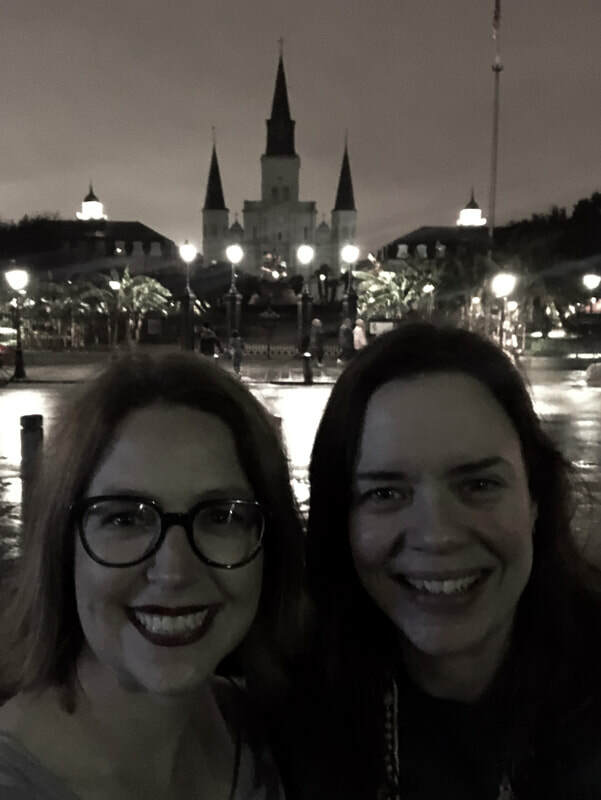 The great irony of this story is that 5 years later, now a mother of two, a solo visit to attend a conference in New Orleans would be just the thing to revitalize my spirit and reconnect me with my deep love of travel. A rebirth, if you will. 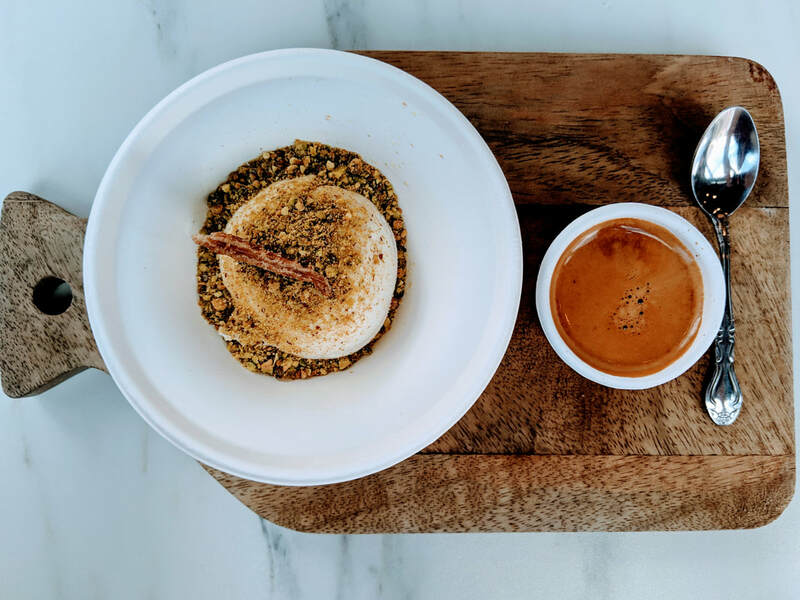 ​Originally, almost my entire stay would be spent at the conference, leaving only one breakfast and two dinners open for my choice, so I scheduled practically every minute to ensure optimal dining and exploring. In a stroke of very good luck, though, my flight home was canceled, and I spent a glorious additional 24 hours in this below-sea level treasure of a city. I had big plans for my first night in New Orleans, but I had been battling the flu shortly before my trip, so with that, the two delayed flights, and the fact that I am 42, I decided to eat dinner at my hotel, The Windsor Court. I actually walked to the Warehouse District to check out another restaurant, but when I opened the door and saw so many young people with so much freaking energy, my mom-hair and I skulked home, grateful for the luxury, peace, and truly delicious food. 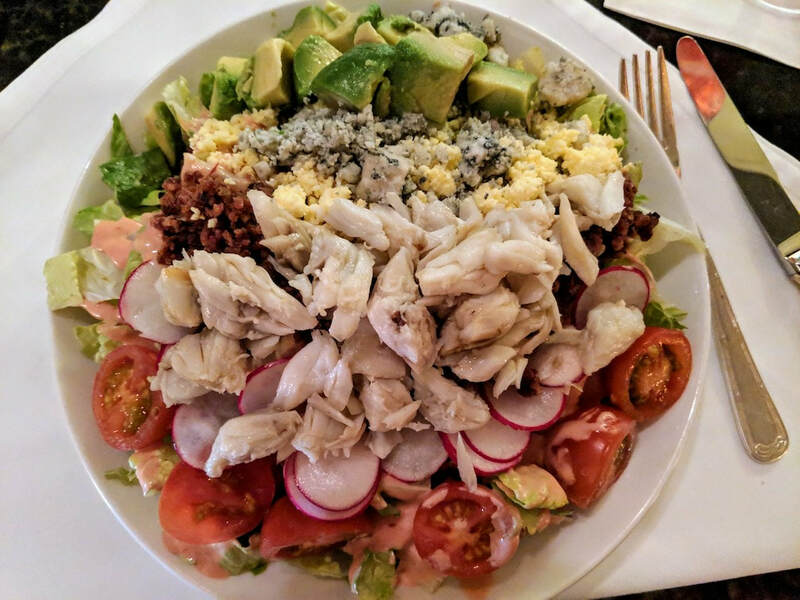 I had the Windsor Court Salad with Crab and I ate the entire thing and not a single person gave the slightest hint of judgement. It was fresh, light but hearty, and truly delicious. I’m a sucker for an old-timey hotel bar, and The Polo Club is a titan of its industry. I seriously fretted over whether a trip to Jimmy’s J’s was the right choice. 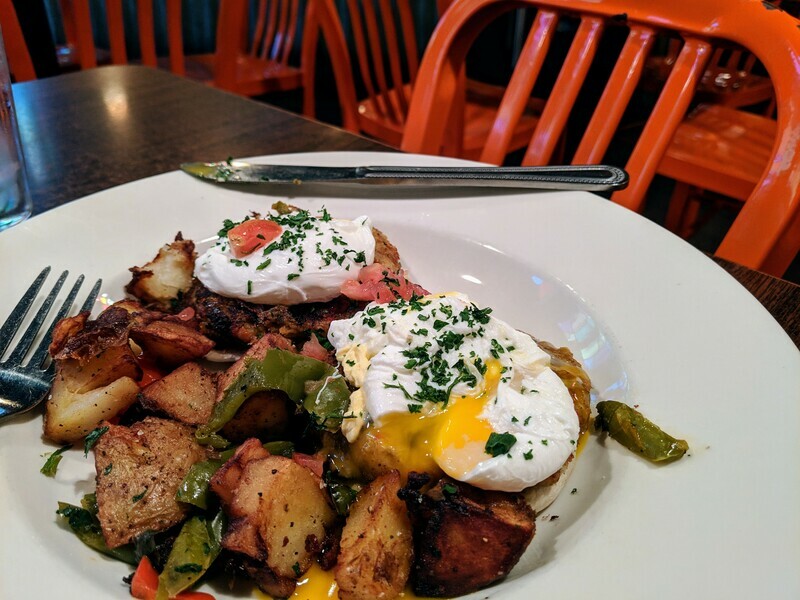 In addition to a great hotel bar, I love a great hotel breakfast, but the reviews of Jimmy J’s coupled with the fact that it was on the way to the conference tipped the scales in its favor, which tipped the entire day in my favor. Even though it was 7:30am the restaurant was fairly full and the atmosphere was lively but not annoying. The music selection was the perfect soundtrack for a fresh start - Stand by Me, Tired of Being Alone (funny, because I was so happy being alone), At Last, and Little Bitty Pretty One woke me up as much as the coffee. This was my favorite meal in New Orleans - I had the Crab Cake Benedict and it was perfection. I chose another breakfast place another morning and now I have no choice but to live my life with regret. Jimmy J’s Cafe is one of the reasons New Orleans has the impressive food reputation it so deserves. If there’s one thing I really miss about NYC, it’s the endless options of affordable and incredible restaurants, particularly Vietnamese establishments. 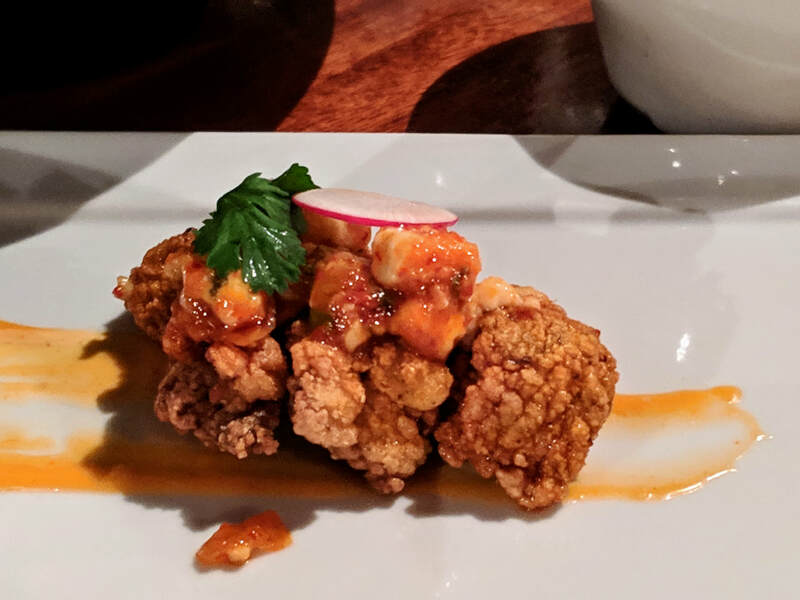 Luckily for me, my sympathetic friend Addie, a Louisiana native with a passion for adventure, was available during my stay to take me to MoPho, a hybrid of Southeast Asian and Louisiana cuisine. The chef and co-owner of MoPho, Michael Gulotta, is a born and raised New Orleans prodigy. Prior to opening MoPho, he was head chef at August, a New Orleans fine-dining institution. Thankfully, while Gulotta left the pomp and circumstance behind, the attention to detail and excellence remain - to say it simply, MoPho was out of this world. We ordered the chicken wings, crispy fried oysters, and the Indonesian Pumpkin Curry. All were fantastic but the pumpkin curry dish was easily the surprise winner of the meal. One of my favorite conversations from this trip happened while Addie and I (mostly me) scarfed down a plate of beignets and two hot chocolates after dinner at Mopho. Beignets are awesome - we all know this, and so mid-bite I asked Addie, “So do you come here all the time?” I wasn’t even kidding! She laughed and said “No one from New Orleans ever comes here, well, except for when friends come in from out of town.” I do have a particularly strong love of fried dough (fried things in general) but I can’t imagine living in close proximity to Cafe du Monde and not going there at least once a month. I’ve been trying to think of the “Cafe du Monde” of New York but nothing comes to mind - although I will confess that when I lived there, I did enjoy salami sandwiches from Eataly on a regular basis, which has all the trappings of a touristy destination. I will do these things for great food. I just will. By the way, I feel it’s important to note that the Red Menace is no longer affiliated with Eataly, so at least there’s that. 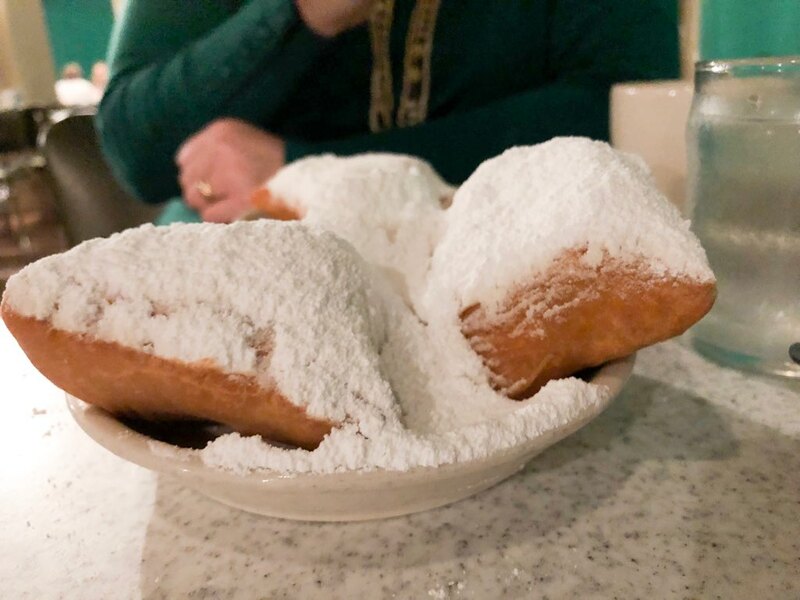 As for Cafe du Monde, you should go there, guilt free, because it’s wonderful, and worthy of its acclaim. 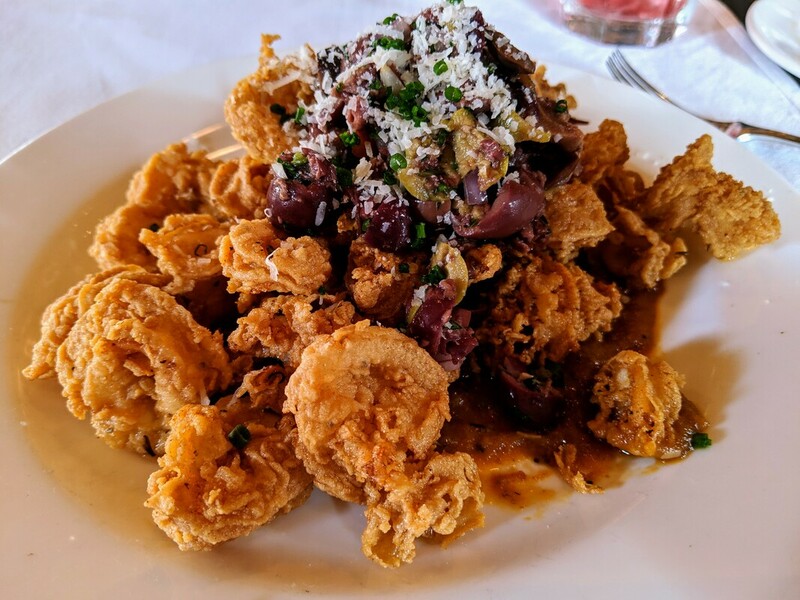 I’d made it to Emeril’s on my first visit to NOLA and seriously loved the fried chicken so I decided to stop in for a “snack” on what was a long day of eating (the best kind of day). I ordered the fried calamari, which is served with a smoky tomato sauce and is topped with olives. This dish has a lot going for it but the olives make it too salty (and I love salt). The smoky tomato sauce is why I include this dish here why it is definitely something I’d order again, (although without the olives). I ate this dish quickly at the bar and was extremely grateful to the bartender who refilled my seltzer with cranberry juice without asking at least 6 times (remember, salty…). 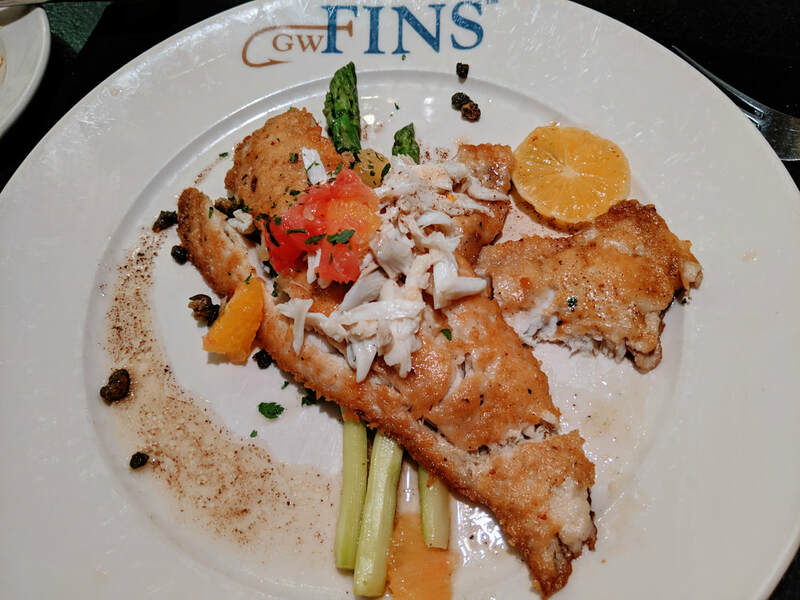 The bartender at Emeril’s gets major credit for recommending GW Fins as the best french quarter seafood restaurant. Typically, I never want to eat at seafood restaurants. I even wonder how seafood restaurants stay in business because I feel like no one ever really wants to dine at a restaurant dedicated almost entirely to seafood. After my night at GW Fins, though, I resolve to move beyond my limiting beliefs, and commit myself to try more pescetarian possibilities. 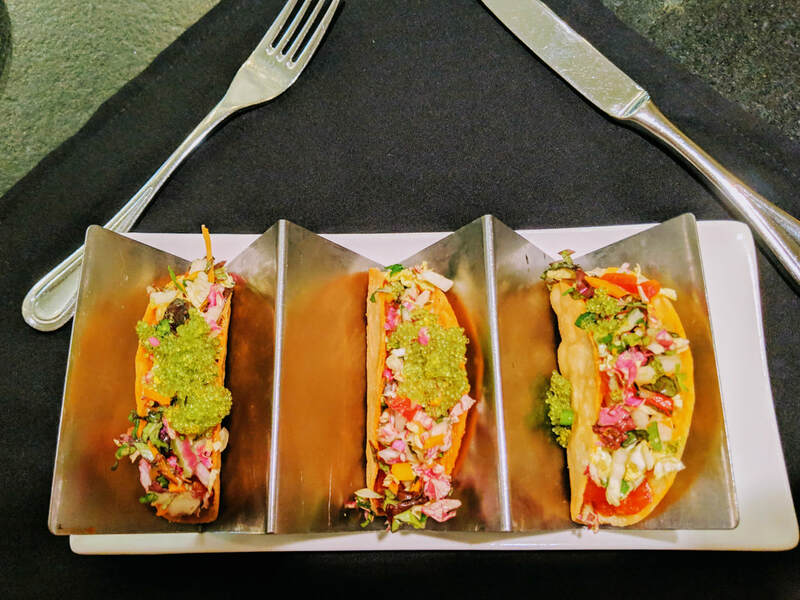 Under the direction of the bartender, who has been serving drinks at GW Fins for over a decade, I ordered the Firecracker Tuna Tacos and the Parmesan Crusted Sheepshead, with a glass of Louis Jadot Pouilly-Fuissé, because I am nothing but pure class. The food was outstanding, but what made the night even more fun was eating at the bar. Shortly after I ordered, another mom traveling on her own sat beside me. On the surface, we were nothing alike - she was from Miami and looked the part, with high heels, great hair, and a perfect tan. I, too, looked the part - the part of Darlene Connor on Rosanne! I didn’t pack enough for the extra day and had used up my “nice clothes” for the convention so I spent my final day in the city in my “flying shirt” which is an extra long flannel, great when you are freezing and 30,000 miles in the sky, not so great when you are traipsing around one of the more humid cities in America. Despite our outward differences, we struck up a lively conversation, and as we shared hilarious stories of dying/not dying parents, C-diff, and the challenges of booking a table for one (WTF, OpenTable? ), I was reminded, once again, that I’m still pretty damn fun, even if on that night, just like the other 3 nights in New Orleans, I was happily asleep, alone in a giant king bed, by 10:30. Miami mom and I exchanged numbers, but it’s entirely possible I wrote something too weird, because our final exchange ended with her sending, “Touch? !” and while I can’t figure why this word specifically was called out (it was a simple, “keep in touch!” after all) our conversation ended there. That said, wherever she is, I hope she’s enjoying a fabulous meal in a fabulous outfit. It gives me hope. I used points to book my hotel stay (btw, the Chase Sapphire card is a fantastic card for accumulating points for travel), and because I wanted this to be a very special getaway, I booked The Windsor Court Hotel. As you know, I’m obsessed with a great bath tub, and so I called the hotel at least 6 times, including from the plane on the way down, to ensure I’d get a room with a great tub. Even though I’d booked with points, which is delivered to the hotel as an Expedia booking, I was treated like a frequent guest who always books direct. Because of my previous work with Tablet Hotels, I have stayed in dozens of amazing properties, and The Windsor Court Hotel still managed to capture my truly jaded heart. 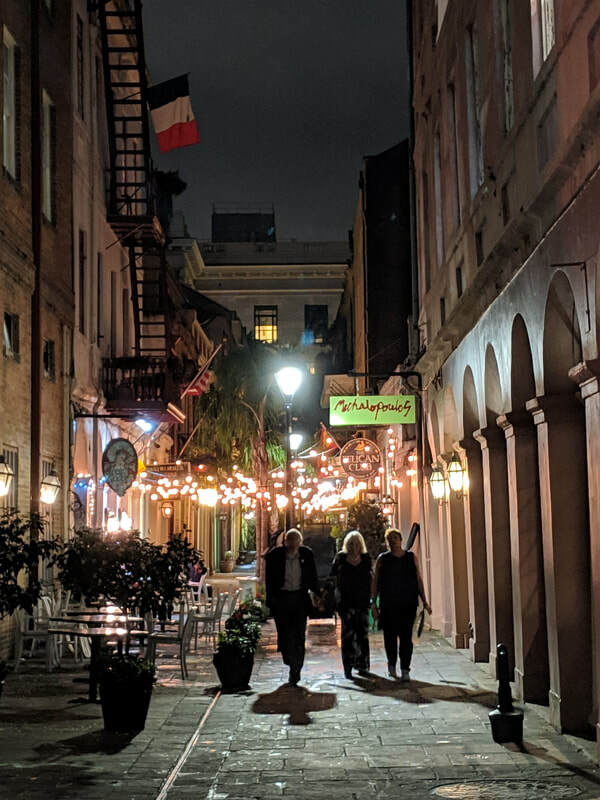 The most surprising takeaway from my trip to New Orleans was a strong desire to return with my kids, as I couldn’t help but notice all the fun activities for little ones. They have great food, a lot of it fried, beautiful architecture with a lot of color, free beads everywhere you go (my girls are crazy into beads), an Aquarium, Audubon Park, an Insectarium, and questionable behavior isn’t only tolerated but welcome! I can’t wait to return and share the fun with family.